Here is your chance to read an inspiring book of faith, hope and daring ambition at a discounted price for the next two weeks. It is based on my grandmother’s life. I’m offering “The Iron Butterfly” at $14.95, a discount of 21% from the original price. The limited time offer ends on October 13. Get your copy today! “The Iron Butterfly” is available at Amazon.com – http://www.amazon.com/author/rosalindarmorgan. 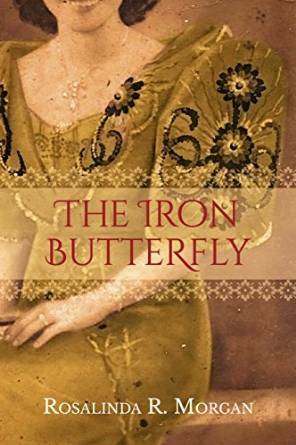 The Iron Butterfly is a gripping tale about the intense devotion and ordeal of Regina Buendia, a young mother who suddenly finds herself all alone and penniless with nine young children to support after her husband died in the pre-WWII era. Facing a bleak future, she has to find a way to tackle a male chauvinistic society where men still rule the business world. Will she be able to break through the barrier? As the Great Depression affected the colonies, she is now faced with new concern – how to survive with business suffering and money being so tight. Just as she thinks she is getting ahead, a major natural disaster happens with terrible consequence to follow. Then her problems become insignificant compared to what was about to happen – the attack on Pearl Harbor and how the war in the Pacific affects their very existence. Honor in the Dust is an eye opener. I lived in Oyster Bay for 40 years and I never heard about the events mentioned in the book. All I heard was TR’s role with the Rough Riders in Cuba. Honor in the Dust changed the history. This is an unknown and hidden part of Philippine history and I am appalled at the atrocities of the U.S. soldiers stationed in the Philippines under Theodore Roosevelt’s presidency and the way it was ignored and covered up for fear of political fallout. After reading this book, I look at Theodore Roosevelt in a different light. The events in Samar, the resettlement camp in Batangas, the “water cure” are things generations of Filipinos should know about and be a lesson not to be repeated. Tyranny is the worst thing a country cannot and should not endure. Filipinos are freedom loving people. I can say that wholeheartedly about the people of Batangas where I came from. They are known for their bravery but they are the friendliest and most hospitable people on earth. They will share you everything they have – their food, even their shirt if you need it. By Rosalinda R Morgan, author of BAHALA NA (Come What May). As I was looking for some old files yesterday, I bumped into this school report about “The Philippines” that my son, Alexander R Morgan, wrote on May 24, 1989 for his World Cultures class. He was 15 yrs old at that time and in ninth Grade at St. Dominic High School in Oyster Bay, NY. Coincidentally, it was his birthday yesterday. Happy Birthday Alex.